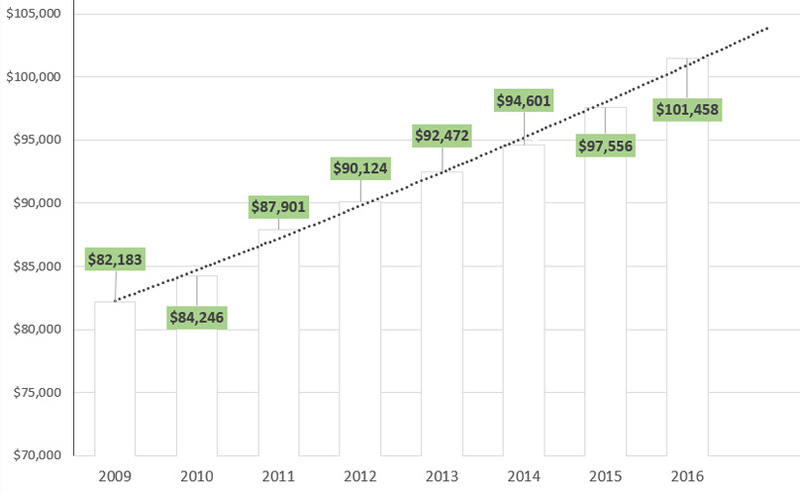 How Much Does a Physician Assistant Make per Year? A physician assistant in the US makes about $90,677, while one working in Canada will earn about C$74,086 (US$55,209) per year. The highest physician assistant salary can be found in Australia and New Zealand, where professionals in this field earn AU$90,000 (US$68,363) and NZ$90,930 (US$63,505) per year. Learn how location, experience, and the industry in which physician assistants are practicing influence their salary in our guide. As expected with pretty much any job on the market, those hoping for the physician assistant average salary should carefully choose the location and industry in which they want to work for the best possible salary. Here’s a breakdown of the average salaries for physician assistants and the most important factors that influence them. Location is the most important factor that influences how much a physician assistant makes. The average physician assistant salary in the US revolves around $90,677 per year, which translates to $43.59 per hour. A beginner in this field will start at about $72,213 and gradually earn more in the next 5 to 10 years, while an experienced professional will make about $126,357. Nevertheless, the most significant salary growth can be observed in the first 10 years on the job. Bonuses can account for $1,019 – $16,486 of the yearly salary and profit-sharing can bring extra $2,053 – $17,218. Physical assistants can also earn up to $37,500 from commission. Generally, proven skills in emergency medicine, acute care, oncology, surgery, orthopedics, or another healthcare branch will further increase the salary of a physical assistant. 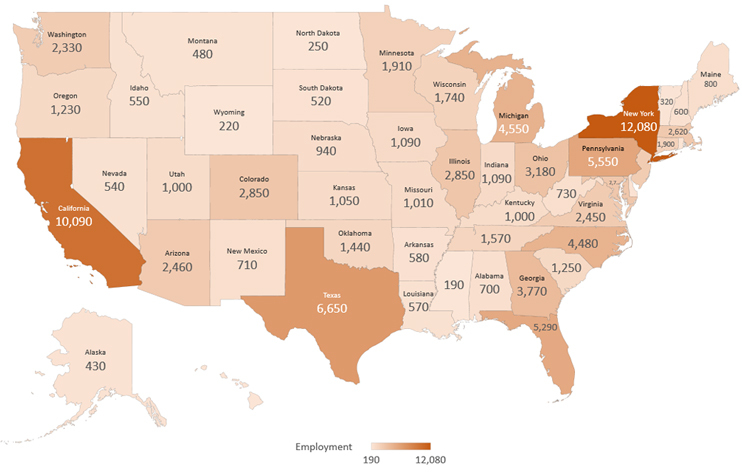 In addition, states like Maryland offer far better-paid jobs than states like Virginia, Georgia, Illinois, Ohio, or Michigan. However, that doesn’t mean that people aspiring to go for a physician assistant starting salary in one of the states not mentioned in the tables below shouldn’t go for the position. There is always room for improvement, and the wage also varies depending on other elements such as specialty, job description, and experience. For those hoping for a career in the field and a physician’s assistant salary, below you will find several tables documenting the average levels of employment and payment for physician assistants throughout some of the more densely populated areas of the United States. 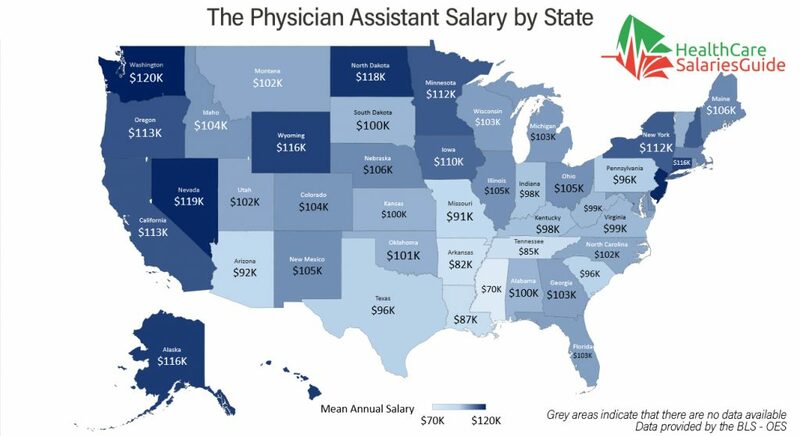 While cities like Miami, FL, Boston, MA, and Philadelphia, Pittsburgh, PA aren’t on the list, anyone qualified enough can still hope to get a decent physician assistant salary. Each candidate’s specialties, experience, and aspiring domain can further influence their pay grade. The starting physical assistant salary in Canada is set at about C$47,784, which translates to US$35,613. After 10 to 20 years, a professional in this field can earn up to C$101,042 (US$75,326), which is more than double the starting salary for this country. Bonuses can account for up to C$1,500 of these amounts. As for job satisfaction, most professionals in this field are extremely satisfied with their workplaces – even though many beginners and mid-career professionals earn less than the national average for this profession. With an average of around £35,000 or US$42,687, the United Kingdom has one of the lowest salaries of all English-speaking countries. A beginner in this field starts somewhere between £30,000 and £31,383, although those working as interns in this field will earn less. With experience, a physician assistant can earn up to £48,034. The average physician assistant salary in Australia is set at AU$90,000 (US$68,363). A beginner working in this field in Australia will earn about AU$70,000, or a little over US$53,000, but with experience will reach a yearly salary of AU$110,000 (a little under US$83,500). Since this job is relatively new to this country, there is no information on the salary of a physician assistant in New Zealand. Little can be said about the job growth after more than 10 years in this field, too. It’s still unclear whether the physician assistant job will continue to exist in New Zealand in the next decades. The average salary of a physician assistant in India is set at Rs374,257, or US$5,616. A beginner in this field will earn about Rs142,031 or US$2,131 per year, while a professional with more than 15 years of experience can expect a salary of Rs973,127 (US$14,603) or more. Bonuses can account for Rs15,500 or about US$233 of this amount. The starting physician assistant salary revolves around R37,095 (US$2,852) in South Africa. After 5 to 10 years, a professional working in this field will reach the average salary of a physician assistant in South Africa is R122,084 (US$9,416). Those who stay in this field for more than 15-20 years will earn up to R302,012 or US$23,227 per year not counting bonuses, which can add another R13,454 (US$1,035). For example, an experienced radiology, dermatology, anesthesia, pediatrics, neonatal, neurology, cardiothoracic PA in Washington could theoretically make far more than an entry level psychiatry, oncology, or plastic assistant physician in NYC. According to a report from the website payscale.com, the average physician assistant salary can grow by slightly more than $20,000 over 20+ years of activity. However, since the website works mostly with the average data from previous years, primarily 2013, 2014, 2015, you can expect a fluctuation of around $10,000 from the showcased data. Of course, the industry in which someone aspiring to have a physician assistant salary plans to work in also influences the pay grade. Be it a surgical physician assistant salary, an orthopedic physician assistant salary, or even that of a dermatologist or an OB/GYN, the average salaries widely vary depending on the healthcare industry. Nevertheless, those looking for a job in departments like cardiology, urgent care, pediatric centers, mental hospitals, or ER can confidently try to apply for a physician assistant job without worrying about a lower salary or smaller chances of getting hired. Generally, people with a physician assistant salary work full time. The most common occurrence is for them to work regular, 40-hour work weeks. However, things are different for those physician assistants working in hospitals. For the physician assistants working in hospitals, extra work hours can usually range from working nights and weekends to being on call. There usually is no overtime, but shifts and working on holidays are also quite the common occurrence. The average hospital physician assistant worked one out of five weekends in 2016. Aside from the physician assistant salary, which is far above the minimum wage, the job also comes with bonuses and benefits packages. According to a recent report, the best medical insurance is given to physician assistants. 81% get full medical, 60% get dental, and 45% get vision insurance. Additionally, most physician assistants get average bonuses of around $15,000 a year. This is what motivates a wide selection of future medical assistants to consider this career. As the demand for medical services has been steadily growing over the past few years, more physician assistants will be needed. In fact, the employment rate is estimated to grow some 30% by 2024. That is even higher than sports or office jobs. The job isn’t exceptionally well paid when compared to other medical specialties. But it certainly pans out to become a physician assistant overall. Not only are the physician assistant salary and bonuses worth it on the long run, but the job is one of the most respected in the field of medicine. And when comparing benefits vs. costs, the long education and internship times are totally worth the future salary.